Polyolefin Elastomer (POE) are produced by copolymerization of ethylene and different comonomers including butene, propylenehexane, and octane. It shows properties including low density, toughness, elasticity, low temperature ductility, UV resistance, and thermal stability. It is used in various end-use industries such as medical, electrical, electronics, and automotive. 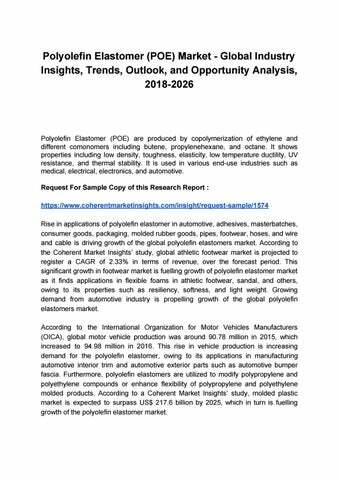 Request For Sample Copy of this Research Report : https://www.coherentmarketinsights.com/insight/request-sample/1574 Rise in applications of polyolefin elastomer in automotive, adhesives, masterbatches, consumer goods, packaging, molded rubber goods, pipes, footwear, hoses, and wire and cable is driving growth of the global polyolefin elastomers market. According to the Coherent Market Insightsâ&#x20AC;&#x2122; study, global athletic footwear market is projected to register a CAGR of 2.33% in terms of revenue, over the forecast period. This significant growth in footwear market is fuelling growth of polyolefin elastomer market as it finds applications in flexible foams in athletic footwear, sandal, and others, owing to its properties such as resiliency, softness, and light weight. Growing demand from automotive industry is propelling growth of the global polyolefin elastomers market. According to the International Organization for Motor Vehicles Manufacturers (OICA), global motor vehicle production was around 90.78 million in 2015, which increased to 94.98 million in 2016. This rise in vehicle production is increasing demand for the polyolefin elastomer, owing to its applications in manufacturing automotive interior trim and automotive exterior parts such as automotive bumper fascia. Furthermore, polyolefin elastomers are utilized to modify polypropylene and polyethylene compounds or enhance flexibility of polypropylene and polyethylene molded products. According to a Coherent Market Insightsâ&#x20AC;&#x2122; study, molded plastic market is expected to surpass US$ 217.6 billion by 2025, which in turn is fuelling growth of the polyolefin elastomer market. Market Outlook Asia Pacific polyolefin elastomers market is growing rapidly and is expected to show substantial growth during the forecast period. According to the U.S. International Trade Administration (ITA), China was the largest vehicle producer between 2012 and 2014 and the average number of vehicles produced between 2012 and 2014 was 17.8 million. Also, vehicle production in China is expected to cross 27 million by 2020 thereby fuelling growth of the polyolefin elastomer market in this region. Furthermore, growing demand for molded plastic products such as toys and other household goods along with growing packaging industry is driving growth of the polyolefin elastomers market in Asia Pacific. North America held significant market share in the global polyolefin elastomers market, owing to increasing demand from the automotive industry. According to the U.S. Census Bureau, total sales of cars and car parts was US$ 1 trillion in 2014 and increased by 6.5% in 2015. Furthermore, according to the U.S. International Trade Administration (ITA), the U.S. was the second-largest market for vehicle production and sale in 2016. Applications of polyolefin elastomers in automotive radiator hoses is to enhanced high temperature performance and for auto interior modifier is driving growth of the market in this region. Europe is expected to be the lucrative market for polyolefin elastomers, due to its increasing applications in plastic, packaging, footwear, and automotive industries. Polyolefin elastomers are used in flexible foam technology such as in the athletic footwear. According to Coherent Market Insightsâ&#x20AC;&#x2122; study, Europe held highest market share in 2016 in the global athletic footwear market. Applications of polyolefin elastomers in plastic modifications is propelling growth of this market in the region. Key Players and Business Strategies Key players operating in the global polyolefin elastomer market are Mitsui Chemical, Inc., LG Chem Ltd., RTP Company, Inc., DowDuPont Inc., PolyOne Corporation, Siloxane Aggrandize Innovative Industries, Dalmia Polymers LLP, Tricon Energy Inc., Borealis AG, and SK Global Chemical Co., Ltd. Companies operating in the polyolefin elastomer market are adopting various strategies for business expansions. For instance, in June 2016, Borealis AG launched three new polyolefin elastomer grades namely Queo 6800LA, Queo 7007LA, and Queo 7001LA. Also, in June 2014, Saudi Basic Industries Corporation (SABIC) and SK Global Chemical Co. Ltd. formed a 50-50 joint venture involving operations of manufacturing plants including Nexlene polyolefin elastomers and plastomers production plants.